This unfortunately is not likely to go anywhere, but I relish the idea anyway. Alleging that Texas has dramatically eroded its safeguards against air and water pollution, two environmental groups are asking the federal government to step in. The Environmental Defense Fund and the Caddo Lake Institute are petitioning the Environmental Protection Agency to strip Texas of some of its authority under the federal Clean Air Act and Clean Water Act. The nonprofits asked the agency to “review and withdraw its delegations of permitting authority to the Texas Commission on Environmental Quality” — the TCEQ — arguing that Texas lawmakers, by gradually cutting funding and passing more industry-friendly laws, have effectively rendered the agency toothless. “We will carefully review and consider claims raised by the environmental groups and respond accordingly,” Melissa Harrison, a spokeswoman for the EPA, said in an email. As it has in other states over the past four decades, the EPA has given Texas the authority to permit and enforce a variety of air, waste, water and mining programs after lengthy and complex negotiations. The federal agency rarely — if ever — has completely revoked a state’s permitting authority. But there have been close calls. In 2013, for instance, Arkansas lost some of its Clean Water Act authority after its legislature passed a bill changing requirements for discharging minerals into streams. Lawmakers fixed the legislation after several permits were routed to the EPA. Experts can’t recall an example where the agency took away Texas’ authority, but the state has faced similar issues. About five years ago, the state refused to follow regulations involving greenhouse gas permits, delaying dozens of energy projects and prompting a major outcry from the industry. 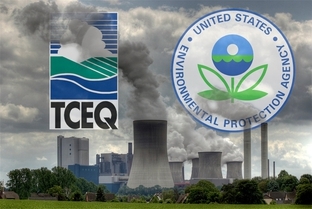 The Legislature relented in 2013 and directed TCEQ to begin issuing the permits. You can see a copy of the petition here, and a copy of the EDF’s press release here. The move was in response to the many awful, anti-environmental bills that passed during the last legislative session; you can read the Trib story for an accounting of that. The EPA doesn’t sound particularly enthusiastic about picking this fight, and given how often they’ve had to defend themselves against lawsuits filed by Texas, I can’t blame them for being leery. I still hope they’ll at least put enough thought into this to deliver a scare to everyone who deserves it. That pollution isn’t our fault!